Kung Fu has been used for centuries in China to improve health and to learn self-defence. A major aim of the training in our Kung Fu syllabus is for the student to become an all-rounded, healthy martial artist who is a productive member of society. In China, Kung Fu can be translated as an art that has been constantly practiced, always seeking perfection. Therefore, you can have Kung Fu in martial arts, playing the piano, or even making tea! In China skills of combat is referred to as Wu Shu. In Chinese the character Wu , which means "martial", is composed of two parts: Zhi which means “to stop” and Ge which means “to fight”. Shu refers to "skills". Therefore “skills to stop fighting” is the basic moral principle of Chinese martial arts. 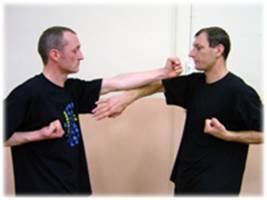 Martial skills are used to stop conflict, both with oneself and others, and bring about peace. Through training, negative or aggressive anger can be channelled in a more positive and productive way for all concerned. Martial arts are also used to promote good sportsmanship either through competitions or two-person practice. Self-defence skills are taught in order to be used only when needed so that we live a happier and more content life.